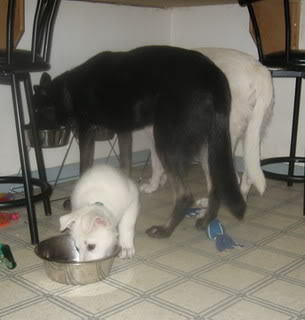 One of your priorities for the next 16 months after receiving your puppy is his nutrition. Proper nutrition is one of the foundations to a great dog and a long life. White Swiss Shepherds can have hip issues. Osteo issues in general. It can be vastly avoided in many ways. First, NEVER let your puppy be fat. You should see the first 2 ribs. A lean puppy is a healthier one. Bones are soft and growing, if allowed to carry even a bit too much weight it will stress the joints which can lead to issues as they get older. NEVER feed your pup any puppy chow, or puppy formula at all. It is high in fat, calories, and cereals. Use an adult formula food that won't encourage RAPID growth. When they grow up switch to large breed adult food that is grain free. I use "Orijen" for pups along with a raw premade diet. If feeding kibble always change to different ingredients when buying a new bag. A reputable brand will always make several options. This helps lower the risk of allergies occuring later in life and also helps stop them from getting bored with their food. A properly formulated raw based diet is always the best diet for any dog. Hence why I do both. Human food...Dogs are omnivores not carnivores. They love vegetables. I give mine usually the left over veggies from our meal that day. This way they get the added vitamines and some extra flavoring to their evening meal. Meat scrap too. I only give these leftovers with their kibble at their mealtimes, not ever from the table. Variety is GOOD. Keep away from BBQ sauces and overly spicy and salted stuff. No cooked chicken bones of any kind ever. Mine also love to get a raw frozen deer bone once a week. This is great for cleaning their teeth along with the nutirnets they get form it. When your puppy arrives it will be on 3 meals a day, 1 of raw and 2 of non-moistened kibble. I will advise as to portion. About 3/4 of a cup per meal. AND FOR HEAVENS SAKE, NO CHOCOLATE...Or sugary deserts at all. Dogs are descended from wolves. 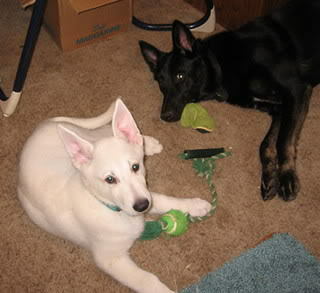 White Swiss Shepherds especially have carried over much of their pack behavior from their origins. Dogs are den animals. Just like wolf packs. They LIKE to have a space of their own. Dark & small & secure. It’s a place to sleep, rest & relax. When your dog is about a year old you don't even need to shut the door anymore. He will go there often. When your puppy comes home it will be used to going outside & pottying there. It will not however be completely housebroken. One sad way to become disillusioned with your puppy is to wake up every morning to pee & poop on your floors & carpets. Stepping in it, or even just having to clean it right out of bed is a ticket to puppy failure. This is YOUR failure, not your puppy's. He is a baby and as such must be contained at night. Also periodically through the day for naps, and when he is not under your direct care. It teaches discipline & self-control. Never remove the pup when he is howling, remove him when he is quiet. Some people feed in their crates. We start doing this when the pups are about 7 weeks and have been matched with their families. This is to teach them to eat on their own and to be on their own for a few minutes. You can see some 7 week old pups eating in the picture. Believe me a puppy is work, & boundless energy. You will need those breaks. Of course most likely you work as well, or go shopping or to a movie, right? What’s to keep young fido from eating your couch? Eating garbage or chewing on a wire? A very dangerous & messy pastime. These are the things that ruin relationships with puppies. I want to reiterate that it’s not his fault; it’s your fault for not providing proper care. Your puppy will need many toys of its own. Let him play with them but more importantly a couple should always accompany him to bed in the crate. A crate should be big enough for your adult dog to stand without touching his head and be able to turn around completely. NO SMALLER. I suggest buying a 700 model and blocking it off with milk crates till they grow into it. That saves buying a crate for each stage. For you who have a pup being shipped he will come in a crate that will work for a few weeks. Then use it to block the bigger one. 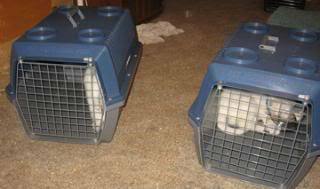 I will be putting the pups to sleep in crates for a week before the transition. This way they are used to it and can still smell & hear their littermates. Toys are very important in the life of a pup. They need all different kinds but they also have to be geared for the size and age of the pup. For example a squeaky rubber toy may be perfect for a young pup without the jaw power to chew through it but by the time they are 6-8 months old it could become a choking hazard if the pup chews through the rubber and swollows some or the squeaker. So always make it a habit to go through your dogs toys every week and re-evaluate whether they have outgrown them or if they are do badly chewed that they might be a hazard. Some of the toys I prefer is the knotted rope(great tug toy), kongs, large sized balls, frizbees, some squeker toys, a feed ball is great for treats and keeps the pup busy for a while, bones and chews are also very important. Variety is very important. I like to rotate toys once a week. The dogs get excited when it is cleaning day and they know they are getting "new" toys. Where really they are just toys that they have not played with in a couple of weeks. Also never get a toy that is in the shape of a household object that you don't want chewed, ie shoes. All it does is teach them to chew things in the shapes of of that object. Think of it this way. The more toys the pup has the less likelihood they will want to have your shoes.